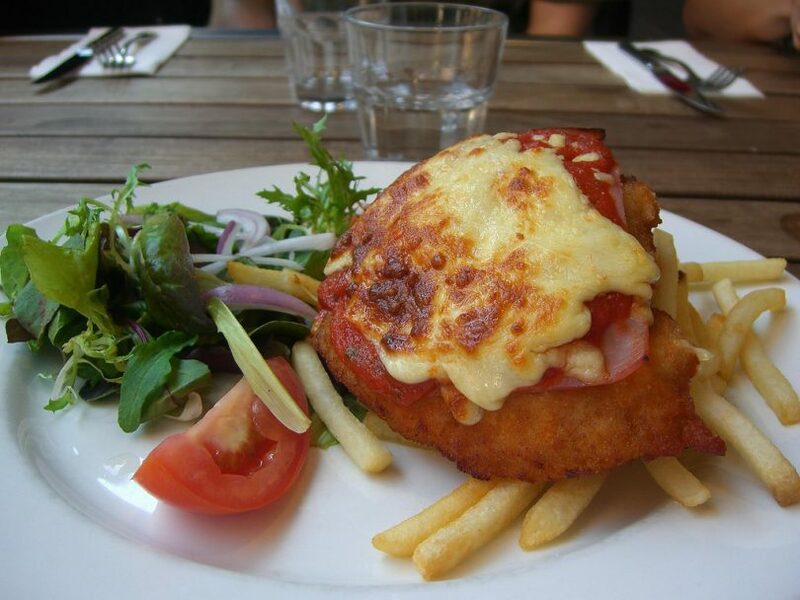 Chicken parmigiana is raising money for Aussie farmers during August. Photo: Flikr Alpha. The spirit and resilience of Australian farmers is being tested right now in the midst of the tightening grip of widespread drought. The ticker and skill on show from east to west has been matched by an equally big dose of good-natured larikin charity. ‘Parma for a Farmer’ raised its first dollar in Bendigo, with organiser Amanda Kinross saying the catchy idea came to her in bed. It was her response to the “appalling situation the farmers are in – it was playing on my mind,” Ms Kinross told The Project. Over 900 pubs, clubs, and restaurants around the nation are now on board. At least one dollar from every cheesy, gooey, crispy chicken parmigiana sold during August at each venue is being donated to ‘Buy a Bale’: an organisation providing practical, grassroots support to dry, stressed Aussie farming families. $9500 buys a semi-trailer load of hay and transports it to an affected area. The George Harcourt Inn and Casey Jones Pub will be serving up chicken parmigiana for $40 on Thursday (16 and 23 August), ensuring the entire $40 will go to the campaign. Canberra Southern Cross Clubs – Woden, Tuggeranong and Jamison. New locations are being registered every hour as the idea grows. Friends, families, and workplaces are also organising ‘Parma Parties’ as another way of chipping in, and donations can be made at the Buy a Bale website. Buy a Bale was born in June 2013, the thought bubble of Charles and Tracy Alder who had been reading about Queensland farmers left with no choice but to destroy their cattle. Since the first hay drive in September 2013, the program has delivered over 160,000 bales of hay across four states, with donations totalling over $4.5 million. This dynamic duo has grown the Buy a Bale campaign into a charity called Rural Aid, and expanded its reach and support not just to rural communities coping with natural disasters but communities in need of broader but always practical help, including Farm Army, the Gift of Music, Farmers R&R, and a counselling service. If you are part of ‘Parma for a Farmer’ in the Canberra region and we haven’t mentioned you, please let us know so we can help spread the word and ‘Buy a Bale’.